Architectural Titanium supplied 2,200 square meters of 0.4mm thick G1 finish titanium that was used to clad both sides of honeycomb panels that were installed on a unique structure that spans over the streets. 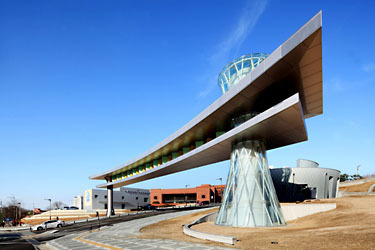 This is the very first installation of architectural titanium in Korea. Eltop Architects from Seoul Korea created this beautiful and modern structure at the main entrance of the university campus.